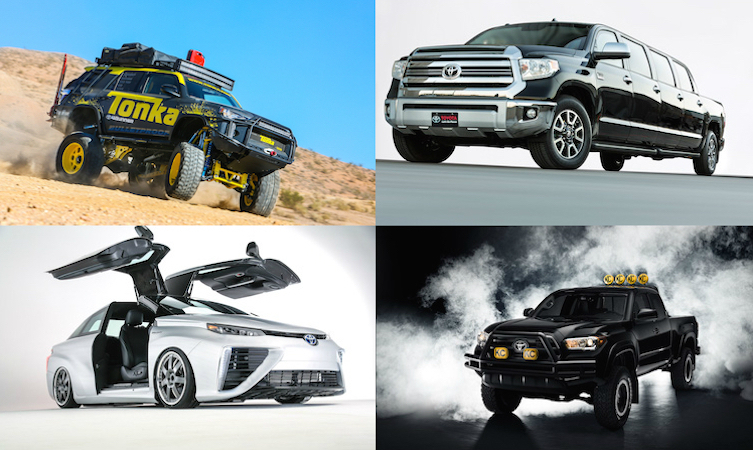 Pumped-up off-road MPVs, incredible racing cars, street-style specials and classic Toyotas of the past five decades are part of an impressive Toyota turnout at the SEMA 2015 car customising show. Running at the Las Vegas Convention Centre in Nevada, USA from 3 to 6 November, the 2015 edition of the modifiers’ Nirvana will feature 14 new Toyota builds as well as appearances from stars of the car world across the pond. Putting the ‘Toy’ in Toyota, this life-size Tonka SUV was created in co-operation with Funrise Toy Corporation, manufacturer of Tonka toys for Hasbro. The Tonka 4Runner is powered by the same 4.0-litre V6 as the production 4Runner — but that’s about the only similarity between the two. 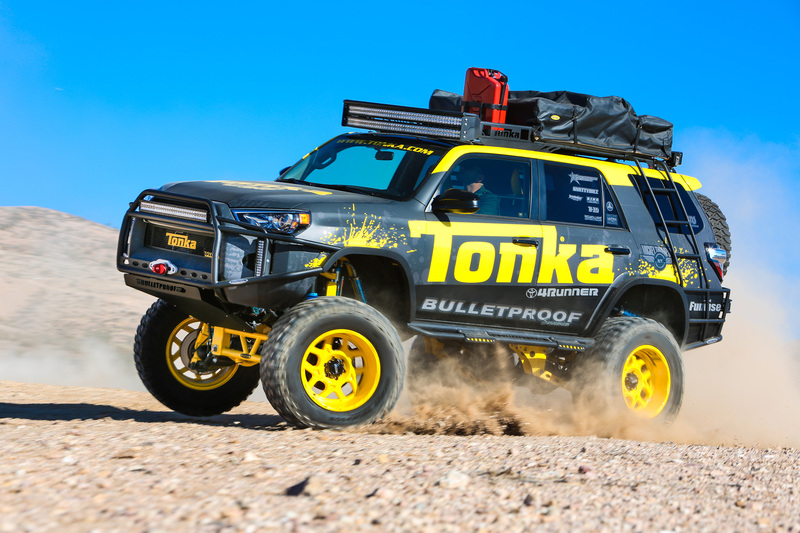 The concept vehicle’s body — elevated to new heights by a 10 inch Bulletproof Suspension lift kit — sports matte black and yellow Tonka graphics. Twenty-inch Ultra Motorsports Type 250 Colossus wheels are shod with Mickey Thompson Baja MTZ off-road tyres. Over each tyre are Rigid Industries LED lights, so that the vehicle is as impossible to miss at night as it is in broad daylight. The custom suspension includes King 8×2.5-inch and 10×2.5-inch coilovers, as well as an assortment of Bulletproof Suspension components. Bulletproof also designed the vehicle’s welded bumpers, roof rack, side steps and ladders. The crowning touch is the pop-up tent on the Tonka 4Runner’s roof, which makes the SUV the ultimate dream machine for outdoor enthusiasts. Next up among the Toyota showstoppers is this – a stretched Toyota Tundra nicknamed the ‘Tundrasine’ concept. It started life as a Toyota Tundra 1794 Edition 4×4 CrewMax 5.7l V8 pickup, before Toyota transformed it into a larger-than-life-size limousine — hence the name. The Tundrasine is over 26 feet (8.10 metres) in length and has a wheelbase of more than 19 feet (5.99 metres). The exterior is painted Midnight Black Metallic, and its eight doors open to reveal a custom brown leather interior, inspired by the cockpits and passenger compartments of luxury private jets. 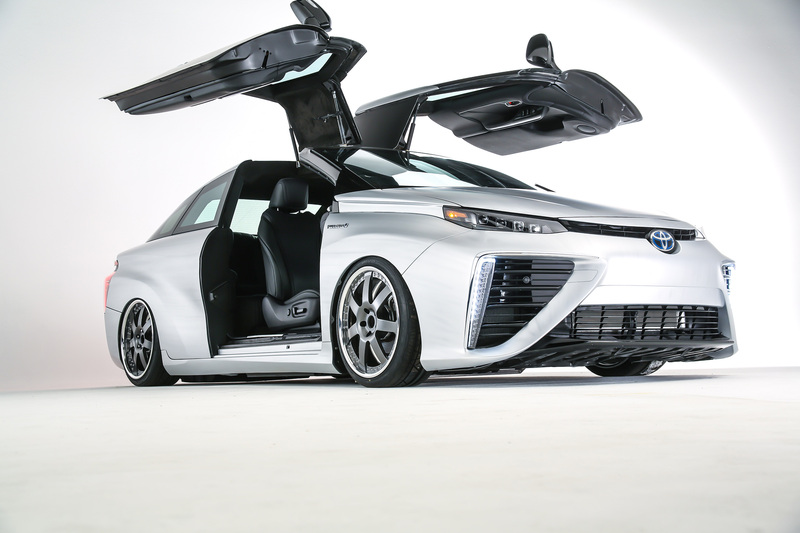 Even the groundbreaking hydrogen-powered Toyota Mirai is making a SEMA appearance. Created by Toyota with the help of MV Designz, the model marks Toyota’s involvement in the Back to the Future movies and Back to the Future Day back in October. Fittingly, the Mirai has been converted to a two-door body style and given gull-wing doors just like the time-travelling DeLorean from the movies,. 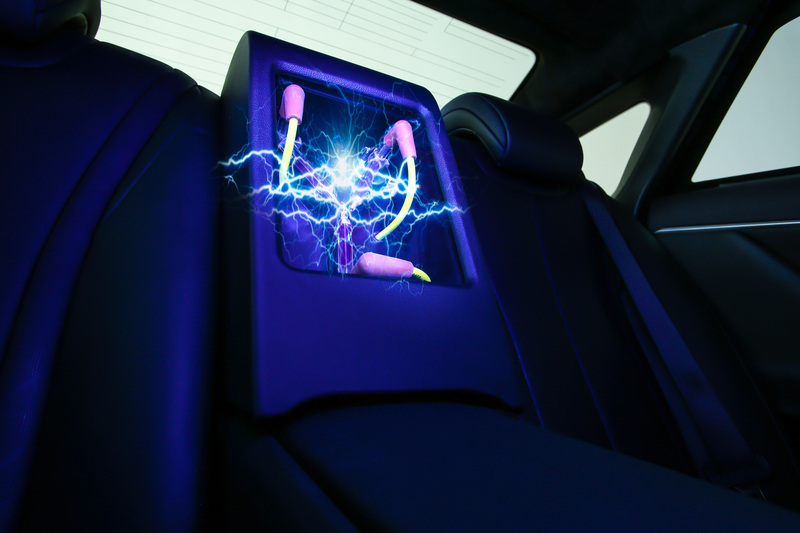 Other modifications include a head-up display inspired by Doc Brown’s invention, custom 19-inch “Infinity” LED wheels and tires, custom air-ride suspension, blue LED lighting throughout, brushed-aluminum paint, a tablet in place of the original equipment head unit and even a ‘flux capacitor’ housed in the modified center console. See how it was made in this video. Read our other Mirai posts here, or learn more at toyota.co.uk. 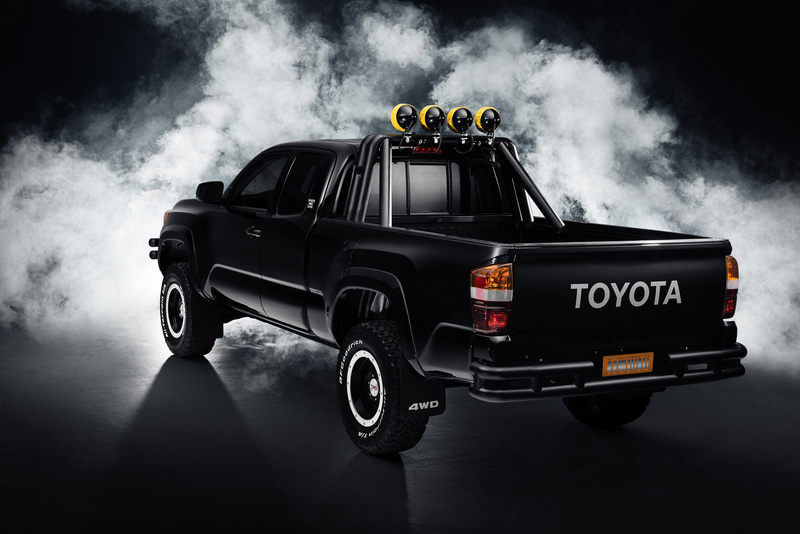 The Back to the Future magic doesn’t end with Mirai – using the new 2016 Tacoma, Toyota has re-created the famous black Hilux from the franchise. 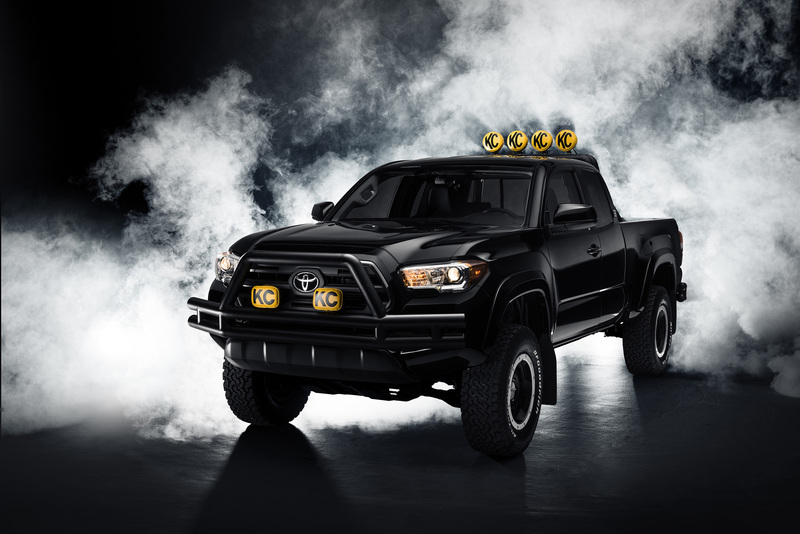 To make the 4×4 look like a modern-day version of Marty McFly’s dream set of wheels, modifications were made including custom paint, badging, lights, bumpers and light bar, as well as off-road suspension and TRD wheels. Watch the Back to the Future Tacoma’s cameo in this video. 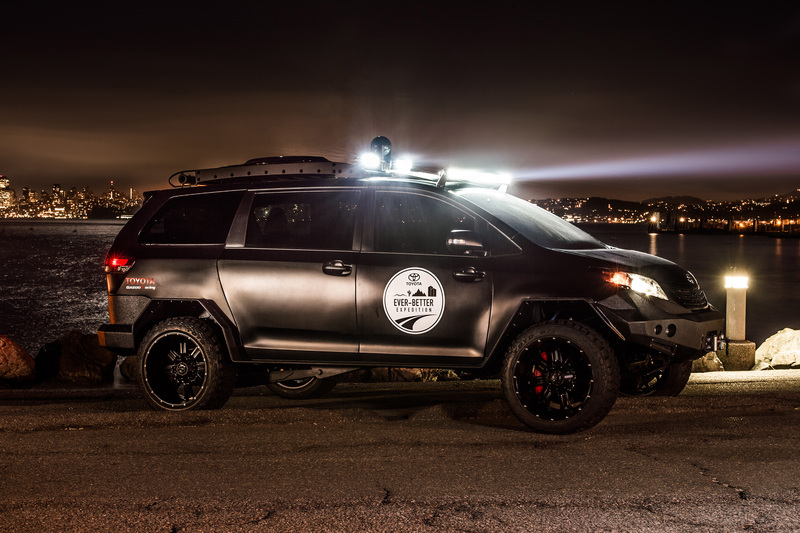 Another imposing Toyota at SEMA: the ‘Ultimate Utility Vehicle’. 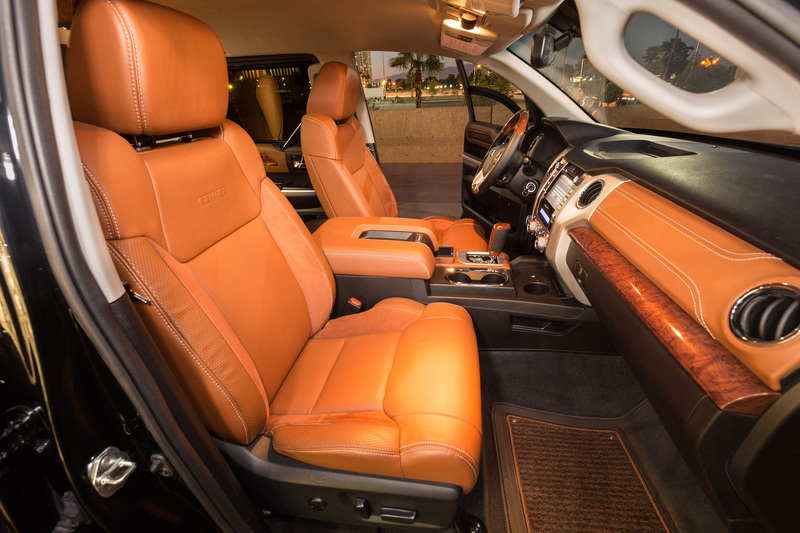 It’s a mash-up of a Toyota Sienna minivan body and a rugged Tacoma 4×4 created Toyota’s Ever-Better Expedition. 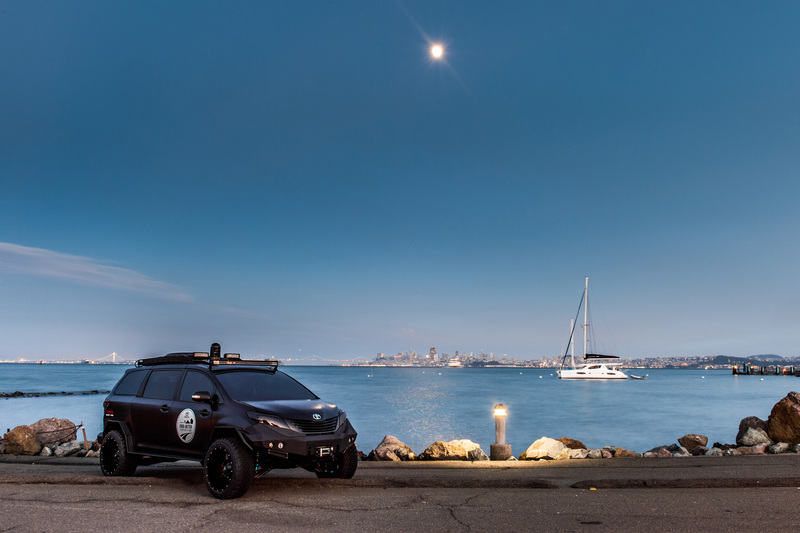 The expedition will eventually span five continents, and during the 110-day North American leg, nine vehicles are being driven over 16,500 miles by Toyota engineers through the continent’s most extreme driving conditions — from the desert heat of Death Valley to the icy winter roads of Alaska, and from the congested streets of Manhattan to the heights of Pikes Peak. 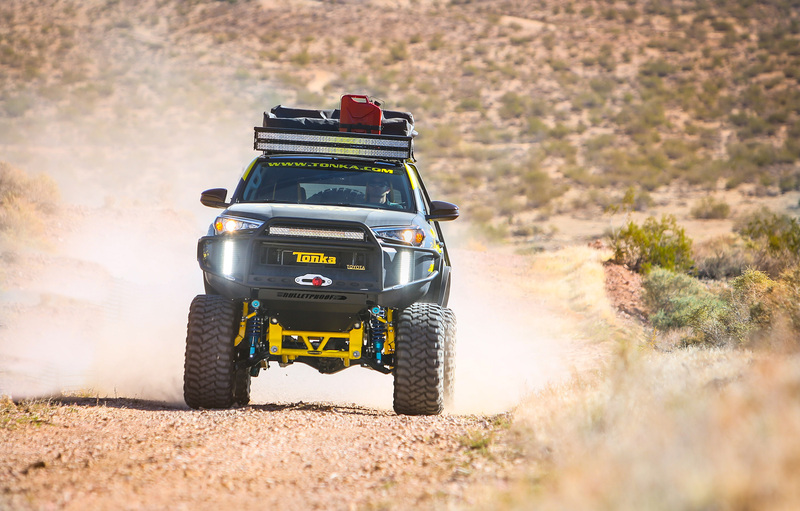 To ensure the capability such a journey requires, the ‘Swagger Wagon‘ is mounted onto the chassis of Tacoma pickup and equipped with a Toyota Racing Development (TRD) supercharger, 22×12-inch Monster Energy off-road wheels and upgraded Heim steering. Also taking a break from the Ever-Better Expedition, the Toyota LC 200 (Australia’s version of the Land Cruiser), will be on the Toyota stand. Highlights from Toyota’s young enthusiast-oriented brand Scion is once again running a SEMA Tuner Challenge this year, with a pair from iM models – better known in the UK as the Toyota Auris. For the 11th Annual Scion Tuner Challenge, reworked versions of the Scion iM 5-door hatchback were created by street wear brands illest and Crooks & Castles. Each team received a Scion iM and a $15,000 build budget to put a unique spin on the car. Rob Panlilio, co-founder of Crooks & Castles, opted for a wide body kit and AccuAir suspension. His team featured a black and white scheme, with an all-white leather wrapped rollcage and black rewrapped race seats for the interior. The car was finished off with custom white mesh wheels. Toyota’s rich motor sports heritage will also be well represented at SEMA. The Joe Gibbs Racing No. 19 Toyota Camry that Carl Edwards has piloted to two wins in the NASCAR Sprint Cup so far this year will also be there. Racing fun isn’t confined to the track—or to traditional passenger cars. 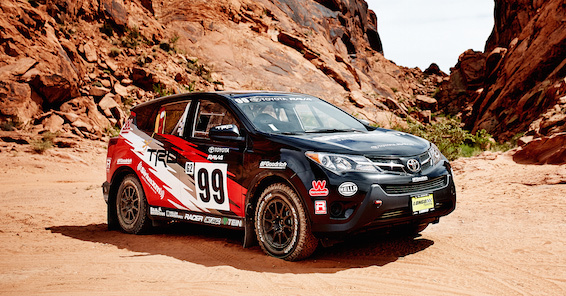 Ryan Millen of the legendary Millen racing family will be at the show with the 2015 Toyota RAV4 he is currently driving in the Rally America series. Although very few mechanical modifications were made to the vehicle, the RAV4 nevertheless has Plexiglas windows, 15-inch racing wheels, rally race suspension and completely gutted interior. Near the Toyota stand, visitors can view a display of parts and accessories from TRD alongside classic Toyotas that have been modified by their owners into innovative, award-winning customs. The five iconic speciality vehicles on display include a 1970 Toyota Crown that won Best of Show at Toyotafest; a 1973 Corolla TE28; a 1985 AE86 Corolla GT-S; and a pair of Supras – a 1988 Supra MA70 and a 1995 Supra Twin Turbo. In addition to Ryan Millen, a number of celebrities will be available for autographs and selfies immediately after Toyota’s SEMA press conference. These personalities include Top Gear USA host and NASCAR analyst Rutledge Wood and drag racing pioneer and 2012 Top Fuel champion Antron Brown. 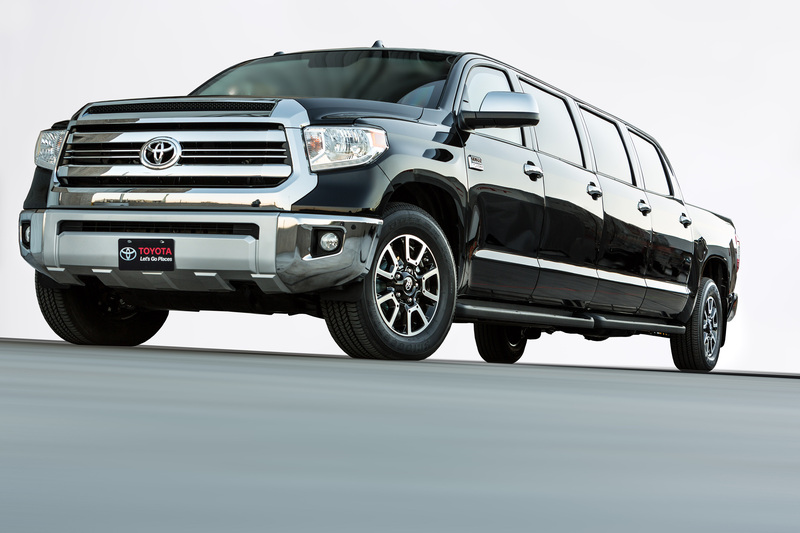 The collection of project vehicles can be seen in the Toyota display booth (#24700) in Central Hall and the adjoining Patio Annex at the Las Vegas Convention Center, November 3-6, 2015. If you’re heading to the show, we’d love to see your pictures and find out what you think! Get in contact via the comments box below or via Twitter @ToyotaGB or our Facebook.